Sudanese Achievements in Politics, How All Goes Wrong? Sudanese Achievements in Politics That Go Wrong! The Sudanese Achievements in politics have always gone the wrong way, since the independence of the Sudan from England in 1956. When anyone asks himself how all goes wrong, and then overlooks the political status from that date until now, s/he will absolutely come to realize the reasons of the failures of national decision making circles in the Sudan. Not aiming at quoting Tom Grennan by snitching the phrase in the title "All Goes Wrong" from the song that he produced and released on 22 September 2016, I really do think that all goes wrong in the Sudanese achievements of politics since the independence of the country. I am the Sudanese journalist Khalid Mohammed Osman who has always been and for half a century inclined warmly with the concept of real politics, which produces real democracy in Sudan. My pain was and is always about the misconception of politics and democracy and the Sudanese official abuse of both of them. Intro to Index 4, Episode 4: Sudanese Achievements! 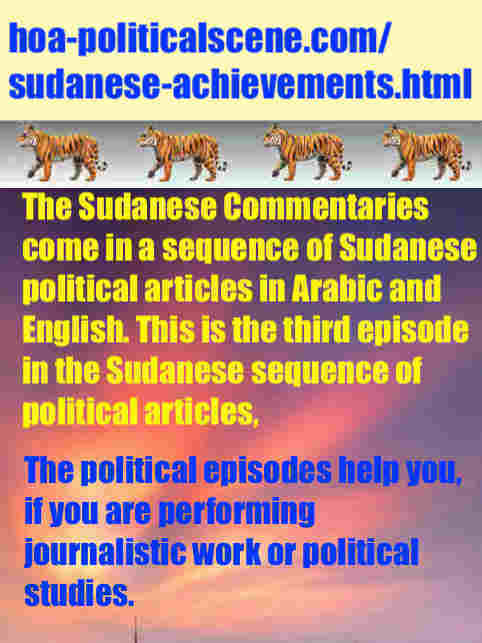 This page on the "Sudanese Political Achievements" is episode 4 in the sequence of Sudanese political articles and Sudanese Arabic political articles. Episode 1 is at Sudanese Abilities. Episode 2 is at Sudanese Absence. Episode 3 is at Sudanese Abuse. Episode 4 here continues on episode 5 at Sudanese Actions and the last one continue in so many episodes. It is very important to mention these resources, so you can follow the sequence in the mentioned episodes to get the complete story of the political catastrophe in the Sudan. There are more than 200 epsiodes in this sequence. The political catastrophe has been precedented by cultural and literary catastrophes explained also through some Arabic poetry, English political pomes and short stories, as the "Suakini Cat" in the HOAs Cultural Project, which is the cultural section of the HOA Political Scene Network. You have already known about the Sudanese mental absenteeism practiced by the Sudanese dictatorial regimes and by the Sudanese sectarian parties, before that to dismantle the people from any cultural, ethical, or literary weapon to use against those dominators from the Sudanese religious parties and the Sudanese sectarian parties. I am here exactly in the first line in this political struggle front to make you understand better and get more insights, so you could figure out how to energize your Sudanese intifada by great ideas and methods to burn those dominators. The comments on Sudan, or as in episode 4 Sudanese Achievements are all about what has happened in the Sudan's political scene, since the independence of Sudan from Britain in 1956. What has happened to Sudan through long decades accountable to be more than half a century is tragedy and sometimes tragicomedy. Not, only that though... the people in Sudan live in the state of Divina Commedia, despite the fact that the political tragicomedy in Sudan is clear. They can't see it for many reasons. In fact, in the sarcasm of the Sudanese political theatre, we have so many laughable to crying incidents matured to reflect inferior complex in the leadership system since the independence of the Sudan. Nevertheless, there have never been anything that man can call a system in the independent land of Sudan. The tragicomedy continues, while the people continue to think that they are independent and free. You'll read all about this on episode 4 Sudanese Achievements and in the other episodes. Just follow the sequence from the beginning. If you got blown away, share the link of the page. 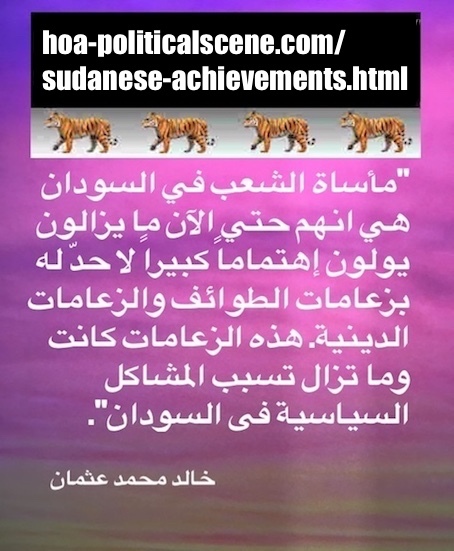 Copy it from here https://www.hoa-politicalscene.com/sudanese-achievements.html and paste it on your messages in any social app. Thanks. Index 4, Episode 4: Sudanese Achievements! So, emerging and extending aesthetically from four words in the first line of the Arabic poem, "If the people in Sudan ever wanted to live" comes in that expression, as a title for the article. After that many essentials marry and follow in guidelines, well explained through different Sudanese angles, (this is one of the episodes) for the Sudanese people to get back to live all-in-one, as heroes and not cowards in one modern, secular and united nation. I definitely like this article I wrote in Arabic and even got to be inspired by it more and more, whenever I read it. It is written in good Arabic literary words. People, please when reading something that inspired you, or thrilled you, please pay it forward: Take the link of the page and share it with your friends in WhatsApp, Twitter and anywhere online in good and family websites. 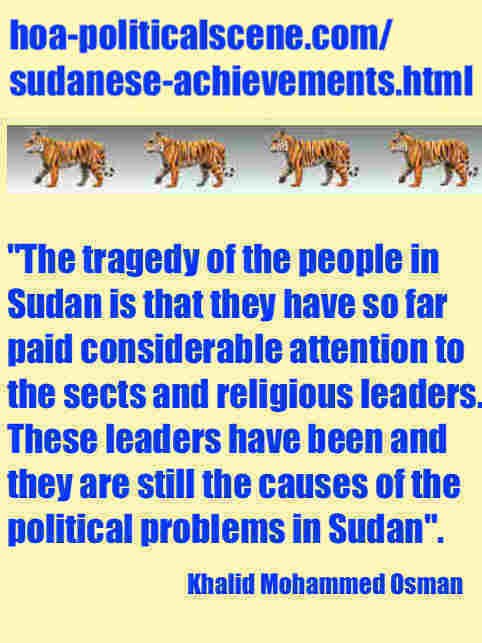 The Sudanese Political Achievements are Clearly Bad! It is very interesting, while looking through the Sudanese political achievements, to see that what has happened in Sudan is also what has happened in Somalia across the borders of Djibouti, Eritrea and Ethiopia, at the east. Jaafar al Numeiri came to power through a coup in May 25, 1969 and Mohammed Siad Barre got to power through a coup the same year also, but in October 21 1969. Muammer Ghaddafi came to power through a coup the same year in September 1, 1969. The three figures have first been politically inspired by the Egyptian leader Gamal Abdel Nasser. From political Sudanese angles, the three militants have the same inspirational source and thus they have the same political orientation. They also believe in superstitions, so they practiced what I call the politics of myth. Regarding Somalia and Sudan, from the same Sudanese political angles, I see Somalia has followed what has happened in Sudan and in Libya. So, the Sudanese achievements have reflected on it. Bad reflection, though. The comparison is that Sudan had the same dictatorial regime as Somalia had during the sixties. Mohammed Syad Berry has followed the same steps of Jafar al Numeri, when he first favorited the USSR as international revolutionary socialist power and then turned to the American power. It is so interesting, as you see from the "Sudanese achievements" and the Somali achievements to get from the left wing of politics to the right wing, just like that, without having any conscience. The two leading figures at that time were from the military and they have the same military thinking, as dictators. As Numeri did neglect the regions and the tribal composition in Sudan, Berry also has neglected, the factors of the Somali composition of clans and religion. The composition of the Somali society, which is composed of tribal issues had been neglected by Berry. The Somali society is not bigger than the Sudanese society, of course. But, those factors were and are still affecting these two societies. The wars in Somali have broken out because of the social injustice. The only difference between the two leaders is that Numeri was from the north Sudan and Berry was from the south Somalia. This is why the leaders of the Somali National Front (from the north) have taken their homeland to be autonomous in self-determination and self-proclamation as independent state called Somaliland. I had good connection with the Somali political struggle at that period and i had lived with one Somali family from Hargeisa the capital city in the Woqooyi Galbeed region of the self-declared Republic of Somaliland, when a brother of two Somali ladies invited me to live with them to solve social issues. During the time in the eighties, when they launched their struggle against Syad Berry, I hold meetings with members of the front, carried some interviews and reportages and helped them getting access to the media in the Gulf area. That has happened actually, at the same time I worked with the Eritrean People's Liberation Front (EPLF) to conduct journalistic works with them and help them get access to the media. So, it is not only the Sudanese political scene I am concerned about. My concern is the entire Horn of Africa. This shades lights onto this HOA Network. That's inclination getting out of love and sincerity. Berry's ambassador in the area visited the newspaper, where I worked to speak with the editor in chief to stop writing about Somalia and the dictator Mohammed Siad Barre. When he requested the editor in chief to meet me, I rejected the offer, becuase I knew that he wanted only to get a list of my resources in the Somali revolution. Regardless to the factors of the composition of the societies in the two lands, the political situations and the misery, along with the wars that swept Somalia, are as the same as in Sudan. The use of religion in politics has always been the problem. See brief history of Somalia, Somali displaced people (IDP), Somali refugees and Somali trouble makers. 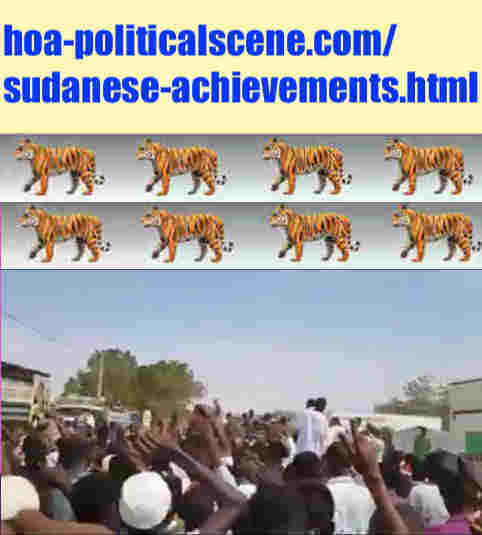 hoa-politicalscene.com/sudanese-achievements.html: Sudanese Achievements: تطبيق سياسة سودانية. Revolutionary Ideas. نمو الأفكار الثورية، الثورة السودانية. Sudanese uprising, January 2019. Have Different Political Views on Sudanese Political Achievements? Did you like what you read in Sudanese Achievements? If you want to comment on Sudanese Achievements, or just want to write comments on Sudan, or any political article on Sudan, you can do that easily here. Use the Comments form below to write about Sudan some of your observation and political stories on the political scene in Sudan. That would be more of political inspiration for us, which could work as a political magic to inspire us to write more. Some of what I have mentioned here on SUDANESE ACHIEVEMENTS could be available on film documentary at TVCinemaApp.com. Comment C2 Entries on Sudanese Achievements appear at the section below the Sudanese Comments form and above this paragraph.